Trading Discipline Waste Of Time? Is Trading Discipline a Waste Of Time? The greatest economist that ever lived was John Maynard Keynes. (All the Austrian School economists, indulge me for a minute). But besides saving capitalism and setting the foundation for our modern world, Keynes was a damn good trader. 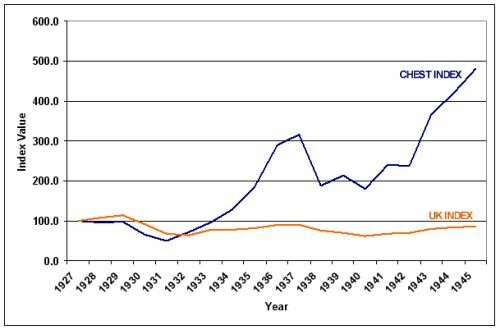 Here is how Keynes performed during the depth of the Great Depression managing the endowment of King College. He managed to increase it tenfold over a period of twenty years. As you can see, for a pointy headed academic, Keynes was a very skilled trader. One of Keynes great quotes is, “I would rather be vaguely right than precisely wrong.” That’s pretty good advice for life overall, but it’s probably the greatest trading advice ever given. I was thinking about Keynes’s words when I was live trading in the BK Chat room during last night’s UK Retail Sales. I was furiously moving in and out of the pound, the yen and the various pound crosses. Suddenly, I realized that there are three very distinct states of trading. There is the ideal trading model that you develop after thousand of hours of observation and back testing. We call that Trading discipline. There is the live market price action that rarely corresponds to the exact parameters of the model. Lastly there is the actual trading that you will do under real market conditions. The last one will only approximate the rules of your model. Don’t get me wrong. It’s extremely important to have all three components in order to trade successfully. You can’t trade a strategy unless the intellectual foundation is technically valid. But it is naive beyond belief, to think that having a great trading strategy is all you need to make money in the markets. The markets are designed first and foremost to wreak havoc with your strategies and force you out of your trades, usually at the worst possible time. Speculative markets are essentially nothing more than massive poker bluffing machines whose primary function is to transfer the wealth from the weak hands to the strong hands. The easiest way to become weak is of course to over leverage your trades. But beyond that I think the other way to let the market wear you down and destroy you is by being too disciplined. I mean by faithfully following your model on every single trade, every single day. Doing that will inevitably create two problems. After some period of time your model will begin to lose — and no matter what you tell yourself — just like a spouse who cheats on you — will grow to resent your model and then doubt it and then eventually abandon it, even though in the long run it may prove to be very profitable. So it’s actually okay to be sloppy, to be imprecise, to make mistakes. In my BK chat room I laid out my run to the 00’s model using crisp, clean instructions that looked wonderfully efficient on the chart. But of course in the mayhem that followed news trading, my execution was off, my first exit was flawed and my second exit was driven more by psychological compunction rather than proper risk control. And yet it was perfect trading day. We made money because I got the big thing right — direction. And most importantly I did not fret about botched executions, or missed opportunities or unfavorable spreads. I focused on the only thing that really mattered — where was the trade going? And as John Maynard Keynes made perfectly clear — in trading and in life that’s the only thing that matters.